Professional Hard Floor Cleaning in London. Your beautiful granite floor has started to look dull and is stained? Try out the professional hard floor cleaning services offered by Thomsons Cleaning to private residents or commercial customers in London. The professional cleaning company offers to clean nearly any type of hard floor surface (outdoors or indoors), including: wood, marble, granite, vinyl, terracotta, stone and many more. All cleaners are very well trained, vetted and properly equipped to clean a wide variety of hard floors. They can restore even very heavily soiled and stained tile, stone, limestone and concrete, and make them look as good as new. Also, the cleaners can apply a protective layer to your floor to keep it from staining and soiling for longer. To receive a free and non-binding offer for hard floor cleaning services for your needs, just call 020 3746 0000 or send an online request with the type of floor and the size, as well as the condition, and you will be given an offer for a fixed price as soon as possible. The customer care staff is available 24/7, so call or write right away! Thomsons Cleaning has specialised in offering the highest quality professional cleaning services to both private and commercial customers in London. It has selected its entire cleaning staff very carefully, and they have been vetted, trained and constantly monitored in order to ensure top quality cleaning and full customer satisfaction. All the cleaning detergents used are Prochem certified and are tested and found safe for people, pets and for the environment. The cleaning machines and tools are also tested for safety and are of the latest generation.The hard floor cleaning is one of the cleaning services, which the company is proud with, and is one of the preferred professional cleaning services in the area. The hard floor cleaning service will be performed by one or more professional cleaners, depending on the size of the area and on the overall condition of the floor.The cleaners will first perform an assessment of the material of the floor, the condition it is and the treatment it will need. Then they will remove any furniture from it and will clean it with a professional hoover, to remove any dust, hairs and other debris and dirt. A small area will be tested for a reaction to the chosen cleaning solution, and then the solution will be applied on the floor and scrubbed in (unless the floor is wood). The floor will be rinsed off and dried off, when needed. Protection, such as wax, seal or polish can be applied depending on the type of floor. The drying of the protective layer can take from 30 minutes to up to 2 hours, depending on the number of layers applied. The professional cleaners are trained to safely and efficiently remove old and degraded polish from hard floors and applying new one. This requires proper skills and equipment, which they all have. The polish will be applied evenly and in the proper quantity and way in order to make the hard floor shiny and great looking once again. This is done after the cleaning, so that the polish is applied on a perfectly cleaned and dried floor with special modern speed rotary floor polishing machine. The result is an amazing, new looking floor surface. As for natural stone floors and grout and tile the company offers a suitable water based impregnator to keep the floor protected from staining. The sealer used is fully sustainable and eco-friendly, plus it is safe for you, your family and pets as well. So, to get your floors back to looking as good as new, all you need to do is to book the reasonably priced and high quality professional hard floor cleaning services offered by Thomsons Cleaning. Combine with another service from our portfolio - oven cleaning or window cleaning and get a discount! In order to book the hard floor cleaning service of your choice, just call 020 3746 0000 or send an online booking request to the 24/7 customer care service. Include the size of the area, the type of flooring and the condition it is in. You will be sent a written booking confirmation in less than 2 hours from your request. The operators will answer any other questions you may have regarding the cleaning service and the possible discounts you can receive if you are a returning customer or if you book more than one cleaning service at a time. 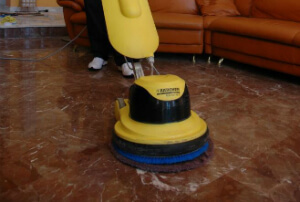 Call now and book the hard floor cleaning service - no deposit is required, and the price is fixed!